SCHOLARSHIP AWARD PRIMARY SCHOOL Bình Mỹ, Củ Chi - givekidsadreams Webseite! 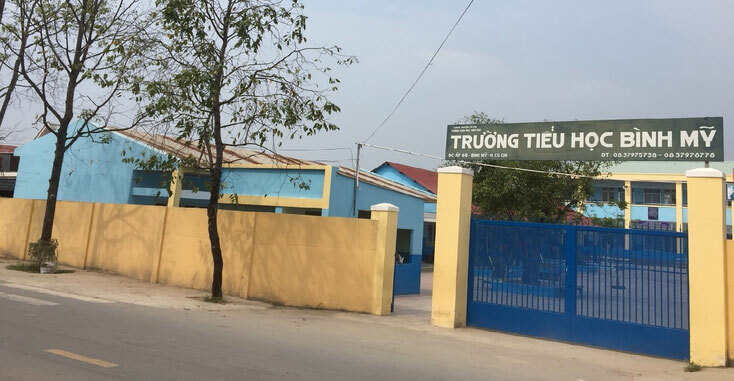 On Thursday, 18.01.2018, as usual on their motorcycle, Mrs. Ninh Hồng and Mrs. Ngọc Anh visited the Bình Mỹ Primary School in Củ Chi, located approximately an hour drive from Saigon. They firstly met the Principal of Bình Mỹ school, Mr. Vân, and Mrs. Lan, Vice-Principal, who are responsible for the award scholarship. Per Mr. Vân’s statement, in spite of so many children growing up in poor households, there are only 5 students who are eligible for an award scholarship of the program Greenleaves of 2017, which is based on student’s performance in class as well as their personal achievement in school. The qualified students also received books from Mrs. Ninh Hồng's bookcase, and a small gift from Mrs. Ngọc Anh's mother. 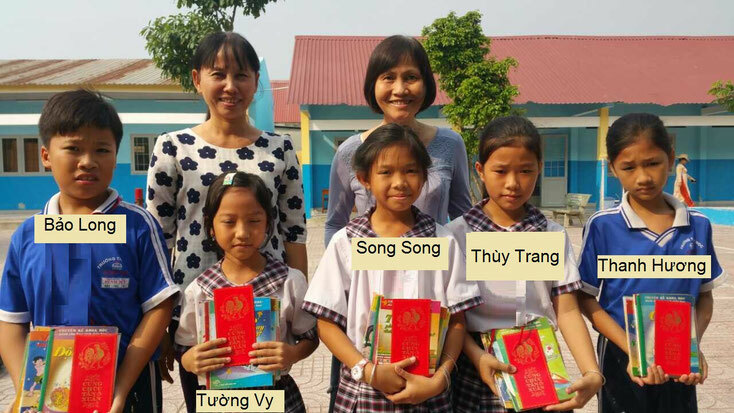 Based on the students' financial needs, as stated in their applications, the two ladies, Mrs. Ninh Hồng and Mrs. Ngọc Anh handed over the scholarship gift as money to each of the students' parents. Phạm Hồ Bảo Long (class of 5/1), a son of a tailor mother, whose father died of stroke 4 years ago when Long was at six. After her husband's death, she could not afford to pay the rent, and decided to move in with her younger brother in Củ Chi. Lê Thị Thùy Trang (class 4/1), whose separate parents, her mother died 2 years ago, Trang now lives with her aunt, a housewife, whose husband works as a bricklayer. They own 3 cows, and the other 2 cows of someone else; and it is considered a main source of living. The house is described as a shack, overpowering smell of the cow's dung. Since there are no tables or chairs in the house, following the host, our two ladies sat down on the bare floor during the visit. Nguyễn Kỳ Song Song (class 4/2), whose parents were divorced 3 years ago. Song’s father has not given any child support for him and her older brother. The family lives with the grandmother at her house, about 10 km away from the school. 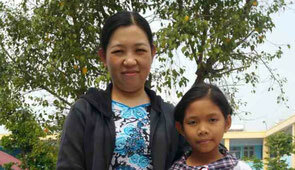 Since Song’s mother is a teacher at Bình Mỹ Primary School, he can accompany her mother to the school every day. 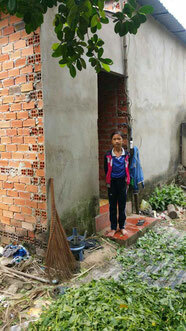 Nguyễn Thanh Hương (class 5/1), whose father is a farmer and a seamstress mother. This family lives in a brick house. Upon their arrival, our two ladies noticed there were many of Rau Muong (water spinach), laying in front of the house which appeared to be ready for tying in bunces for sale in the market. It is noticeable that Vietnamese people who live in some poor remote areas tend to sell Rau Muong, a kind of semi-aquatic plant, easily growing in water or in moist soil, as a source of daily earning. Võ Thị Tường Vy (class 2/3), a student who was abandoned by her own mother when she was in the 1st grade. She lives with her father at her grandmother’s house; the 79-year-old grandmother, who is in good condition, still makes her living to help the family income, by selling Rau Muong (water spinach). Tường Vy’s father, 43 years-old, Mr. Võ Trung Nghĩa works in the incense-stick factory. He stated that he used to be very good at school, unfortunately, he had to leave school for work, earning little income for family. Mr. Nghĩa emotionally said that he will do everything at his best to give his daughter a bright future in education. We all know that the relationship between poverty and education is often conflict in life. To show our gratitude to the donors and sponsors with their gifts/ pledge to scholarship program, parents are encouraged to play an active part in shaping the future of their children. Per Mrs. Ninh Hồng and Mrs. Ngọc Anh, having a field trip is not merely our task in assuring the generous gifts from our donors and sponsors are practically reached to the students' family, to those from broken family, foster parent, as well as abandoned orphans; field trips to our two ladies proposes a chance of approaching to each of student's parents, and to comprehend their desire of which the children need to gain the confidence to pursue a full education, as well as to dream of a better future. Together we make it through!